In battlefield situations, the ability of a soldier to be able to find and/ or make cover against enemy fire was very important. To this end many infantrymen were issued with a General Service (GS) shovel or pickaxe in addition to the Intrenching tool they carried as part of their battlewebbing. This allowed infantrymen to 'dig in' quickly in any situation. 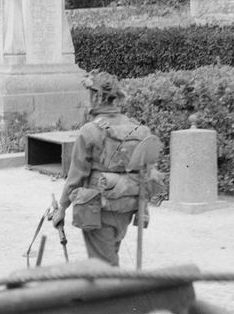 Infantrymen carrying heavy equipment such as a sections Bren Gunner or platoon commands PIAT (Platoon anti tank weapon, Projectile Infantry Anti Tank) operator were not required to carry a shovel or pickaxe. In cold or wet weather, soldiers would wear this leather jerkin over the battledress and put their webbing over it. Not as waterproof as a rain cape (see 'small pack' page) but more practical for every day use. 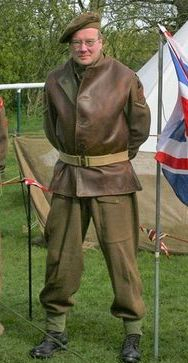 These were not usually carried by soldiers during the D-Day landings but were issued and worn later in the campaign from the Battalion stores. 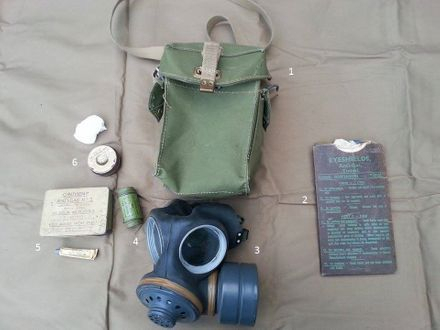 Either slung over the shoulder or attatched to the webbing belt, the gas mask carrier and contents is a lighter, easier to use version than the previous incarnation which served the British Expeditionary Force in their retreat from the continent 4 years previously.